Are you bored with the same old party ideas? Do you want something memorable? We can come to your party or event and run a great fun-filled activity that your guests will never forget. And they'll have a great keepsake item to take with them. You provide the table (or rent one from us if you like). 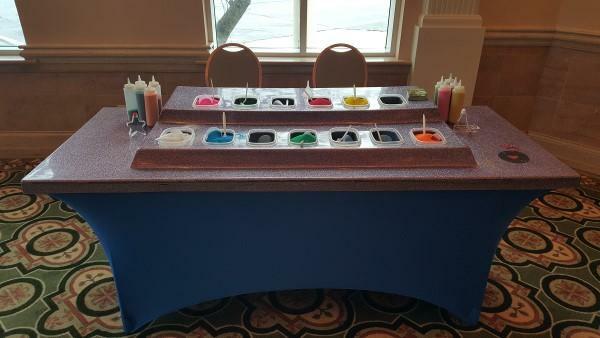 Our sand art package includes a variety of containers to fill. Stars, hearts, aliens, butterflies and more. Both children and adults enjoy sand art. And, it works well for schools, companies, churches, and even home parties. Also works well for fundraisers. This package includes 25 containers, sand, sand art table setup, as pictured below, and an attendant for 1 hour. Additional containers are $2.50 each. An attendant for additional time is $25/half hour. We also offer a Sand Art to Go package. You purchase the number of bottles needed at $2.50 each. Leave a security deposit for our dispensers. Pick up the sand and the bottles from us. ENJOY!!! Return our dispensers. We refund your security deposit. This package works well for those with smaller budgets. Send us an email if you prefer this package.